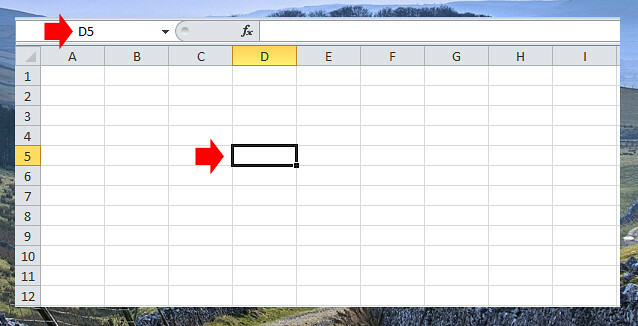 When you open or create a workbook in Excel you will arrive in a grid layout called a worksheet or spreadsheet. And you will notice the letters on the top, it is called Column headings and on the left side you will see numbers, these are row headings. If you want to know how big the worksheet is, there are 1,048,576 rows and 16,384 columns. To go to the last row just hit CTRL + Arrow Down and for the last column CTRL + Right Arrow. When you hover your mouse pointer at the top of any letters the pointer will change to arrow down, when you click, it will highlight the entire column. The screenshot below shows the C Column highlighted. Same when you hover your mouse pointer on top of any number at the left of the grid, the mouse pointer will turn into right-arrow and when you click it will also highlight the entire row. The image below shows the highlighted row 7. The square box on the worksheet are called cell, this individual cell has a name which appears on the name box, it is a combination of column letters and row number. In the example below I will select the cell in Column D that fall on Row 5, the selected cell name is D5 which also appear in the name box. You can try it yourself and explore, make sure you understand how the spreadsheet grid work which is vital when creating functions and formulas that you will learn in our future lesson.